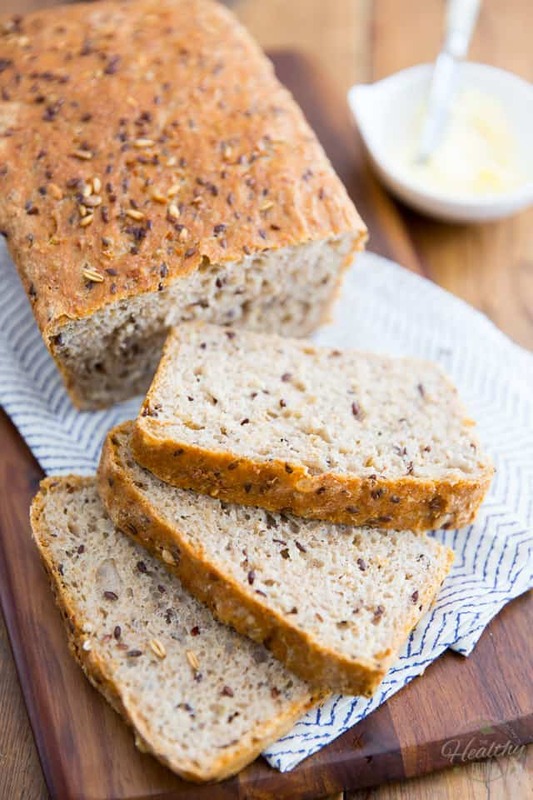 Think making your own bread at home is too much hard work? Think again! 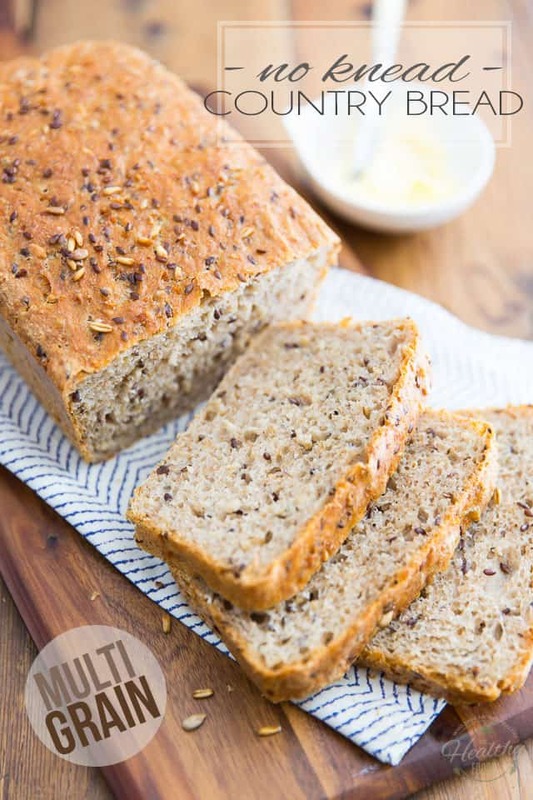 This Multigrain No Knead Country Bread is every bit as easy to make as it is good to eat! 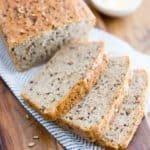 I don’t tend to eat much bread, but when I do get the craving for a slice, I like to make my own bread in the comfort of my very own home. 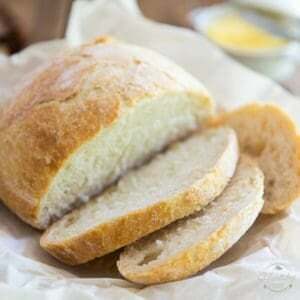 For starters, because nothing quite beats a slice of warm, fresh-out-of-the-oven bread, and well, it makes the whole house smell incredibly good! But also too because that way, I get to know exactly what goes into it. 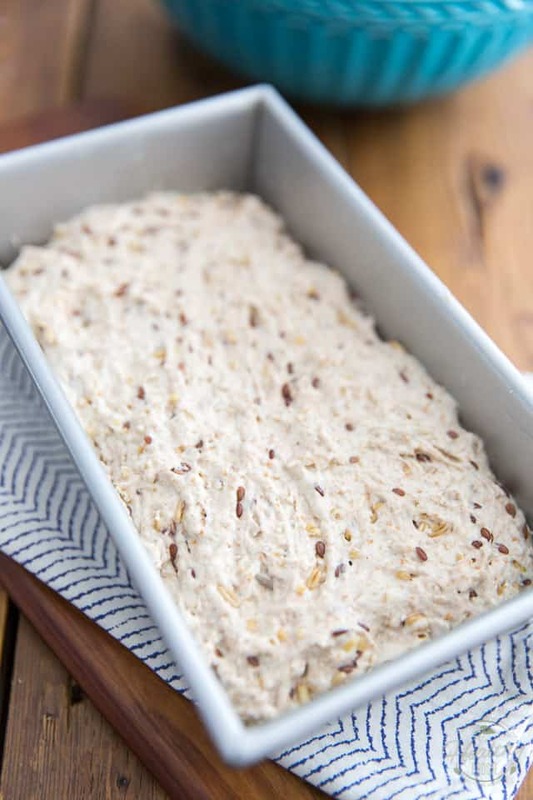 And plus, well, contrary to what you may think, making bread at home can be EXTREMELY easy, and practically foolproof, too. 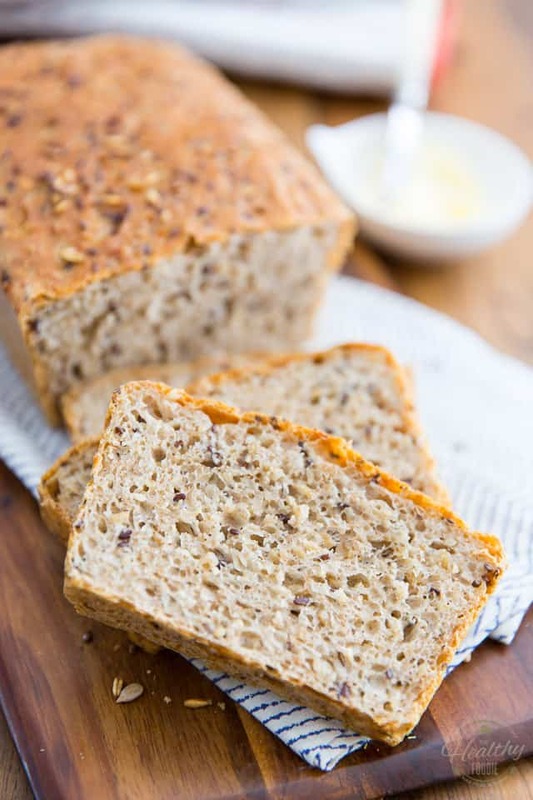 Take this Multigrain No Knead Country Bread for instance. 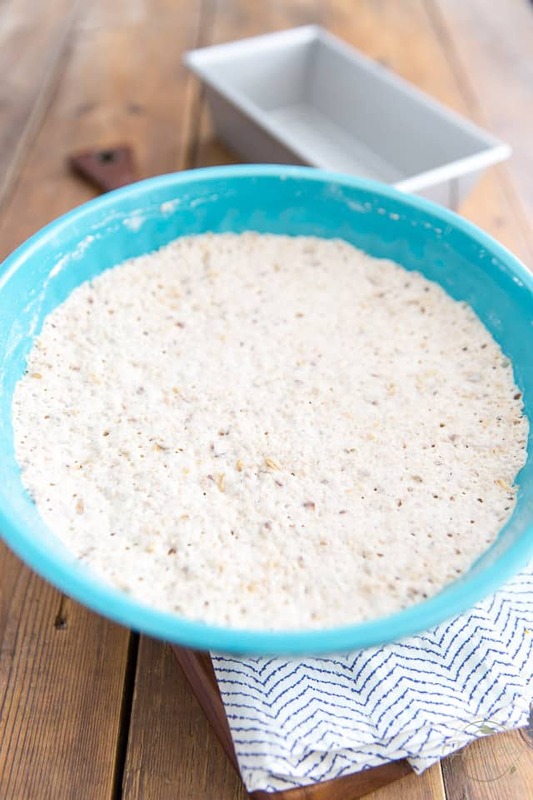 While you do have to plan ahead if you’re going to make it, as it needs to rest and rise for a full day before you get to actually bake it, it’s as easy to make as mixing flour and water together in a bowl. Yes, really. That easy! 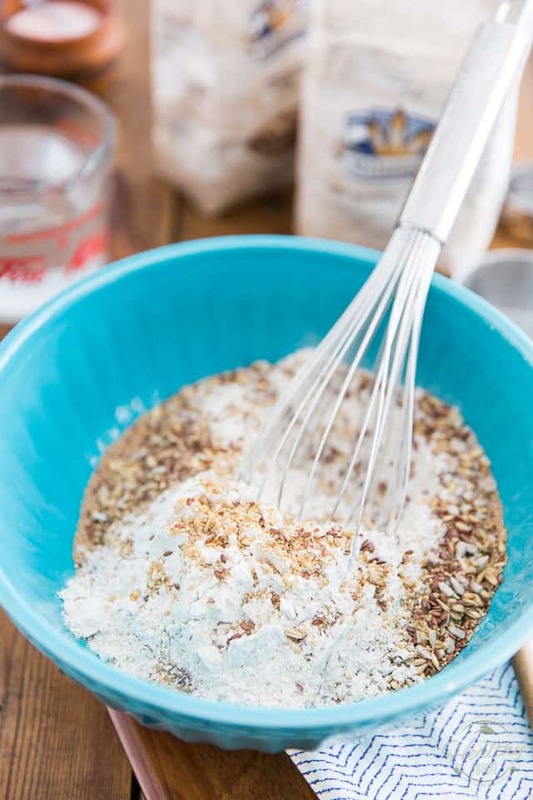 First, you’re going to use a combination of 3 different kinds of flour: 1 cup of unbleached all purpose flour, 1 cup of whole wheat flour, and 1 cup of multigrain flour. Multigrain flour will often be called 5 grain, 6 grain, 10 grain, 12 grain, etc. It doesn’t really matter which one you choose, so long as it’s multigrain! And if you can’t find multigrain, don’t sweat it. 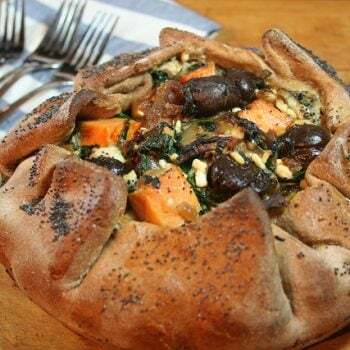 Simply substitute more whole wheat flour for it. 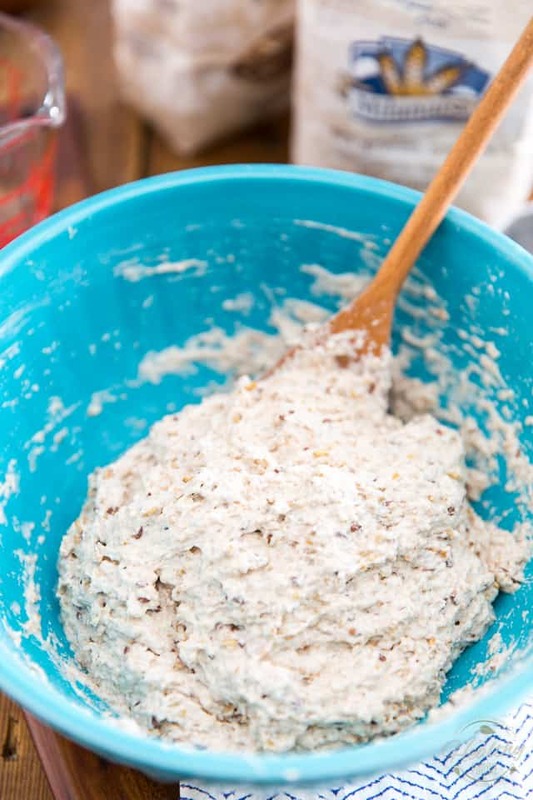 To that, you’re going to add some actual grains, namely 1/4 cup oat groats, 1/4 cup flax seeds, 1/4 cup bulgur wheat and 1/4 cup sunflower seeds. All that goes into a large bowl and gets mixed with a whisk until thoroughly combined. Now that everything’s been mixed together, add the warm water. The only rule here is to make sure that your water isn’t too hot, which could kill your yeast. Slightly warmer than your body temperature is the way to go! Stir until a wet dough forms and all the flour has been incorporated, about 45 seconds. 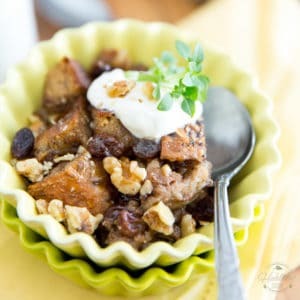 Cover the bowl with plastic wrap and place it in a warm place to rest for 18 to 24 hours. How long to let the dough rest is not an exact science, it depends more on your schedule… go for a minimum of 18 hours, and a maximum of 24, how’s that? The real important thing to look for is that your dough must have more than doubled in size and become sort of spongy. Now you must “punch” the dough, in other words, you have to deflate it. Do that by poking and folding it with the tip of your fingers; the dough will be sticky, that’s completely normal, and desirable! 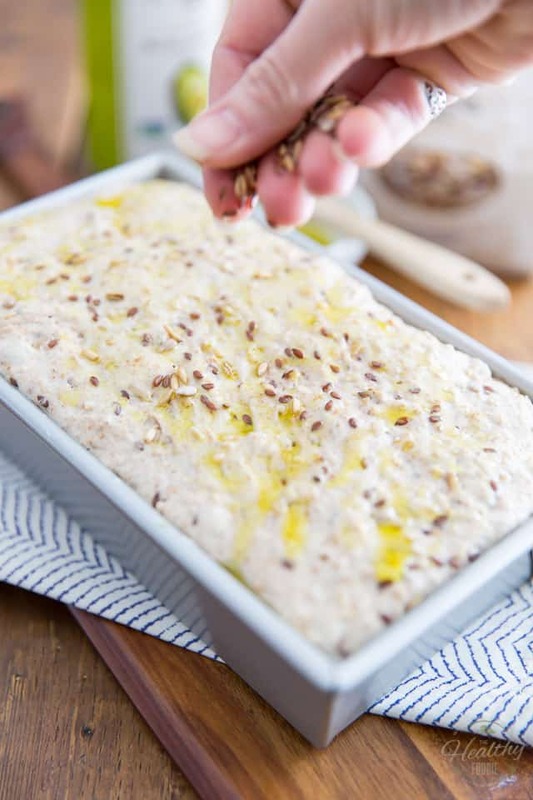 Transfer the dough to a loaf pan and delicately spread it evenly across the pan with your fingers. Cover the pan loosely with plastic film and place it in a warm place to let the dough rise once more, about 3 hours this time. Again, this is not an exact science: the dough needs to pretty much double in size. Aim for 3 hours, but anywhere from 2 to 4 would work just fine. Also, the warmer the environment, the faster the dough will rise. If you’re in a pinch, place the pan in the cold oven and turn the oven light on. This will definitely speed things up for you! 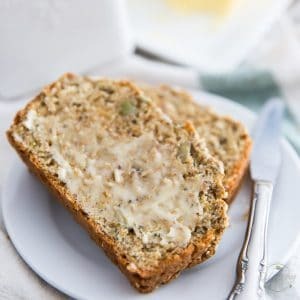 When you are ready to bake your bread, preheat your oven to 400°F; brush the top of your loaf with a little bit of avocado oil and sprinkle with a handful of assorted seeds and grains, if desired. 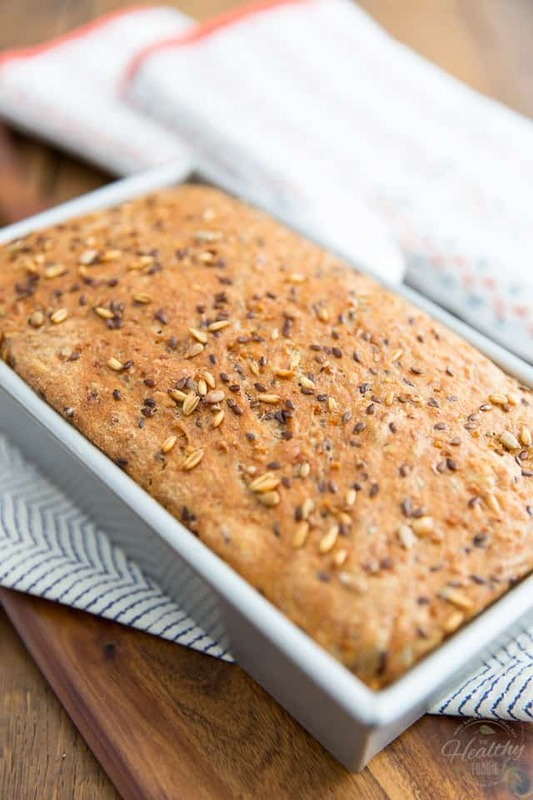 Let the bread cool in the pan for a few minutes then take it out of the pan and let it cool on a wire rack for about 30 minutes before slicing and indulging! 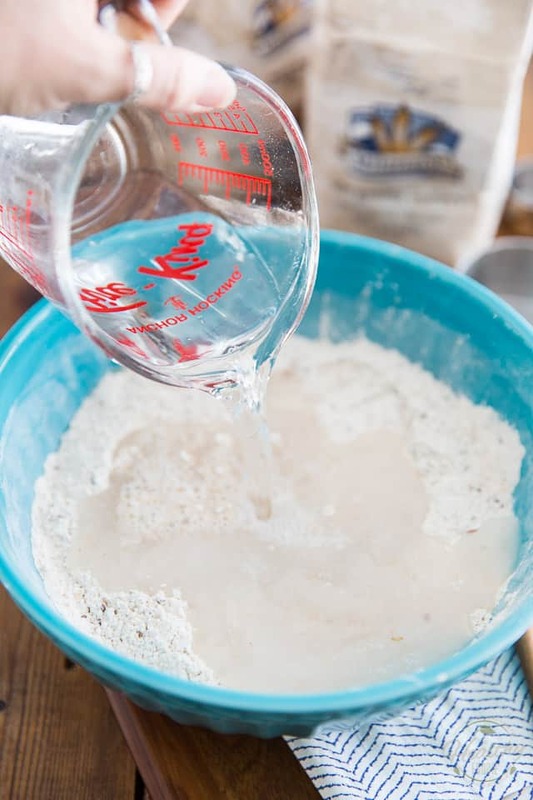 Combine the dry ingredients, including the active yeast, in a large bowl and mix with a whisk until thoroughly combined. Add the warm water and stir until a wet dough forms and all the flour has been incorporated, about 45 seconds. Cover the bowl with plastic wrap and place it in a warm place to rest for 18 to 24 hours. 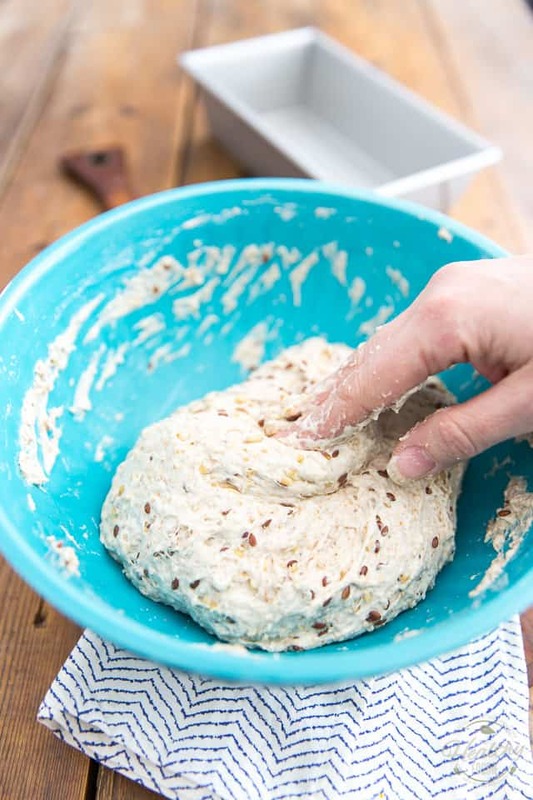 Deflate the dough -it will be sticky, that's normal- by poking and folding it with your fingers and then transfer it to a loaf pan, delicately spreading it evenly across the pan with your fingers. 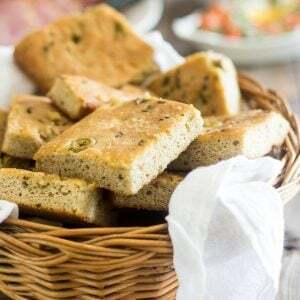 When ready to bake your bread, preheat the oven to 400°F; brush the top of your loaf with a little bit of avocado oil and sprinkle with a handful of seeds and grains, if desired. Bake 40 to 45 minutes or until the top is golden brown and the crust appears crispy. Let the bread cool in the pan for a few minutes then take it out of the pan and let it cool on a wire rack for about 30 minutes before slicing. Store leftovers in a cool dry place for up to a few days. 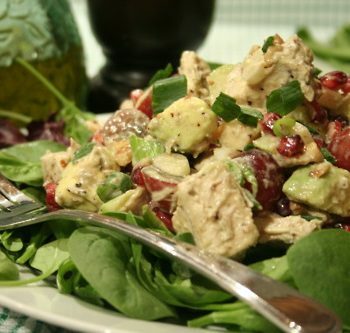 Prep time does not include resting periods of 18 to 24 hours and 3 hours. This doesn’t look ruined at all! I’m amazed at all the grainy goodness you stuffed into it. Hummm ça a l’air trop bon ce pain !! Wow. This looks outstanding. It’s a shame you cannot by too much bread like this. I would love to have some with cream cheese for breakfast. Thanks for the post! Thanks Mark! 🙂 Why buy it? Bake your own! 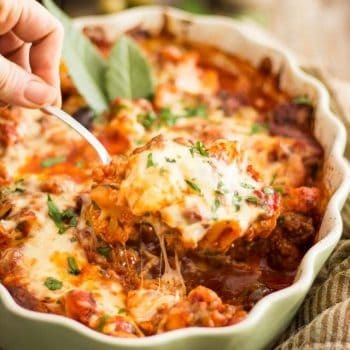 This one is really so easy to make… and you get to smell it as it bakes as an added bonus! hi there, what brand of 5 grain flour did you use? thanks! thx so much! 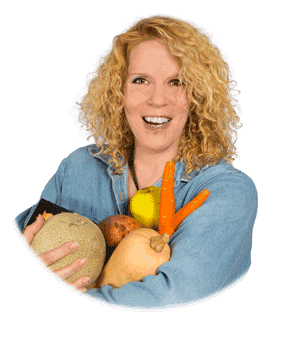 do i put the raw grains into the blender and whiz it up if i want to make my own? any suggestions for particular grains to use would be helpful. 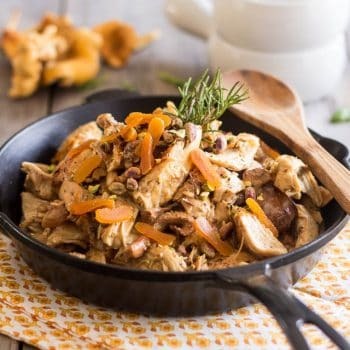 would it work with quinoa, buckwheat, and rice flour? Oh my goodness, this makes my mouth almost water. Love the way this looks.